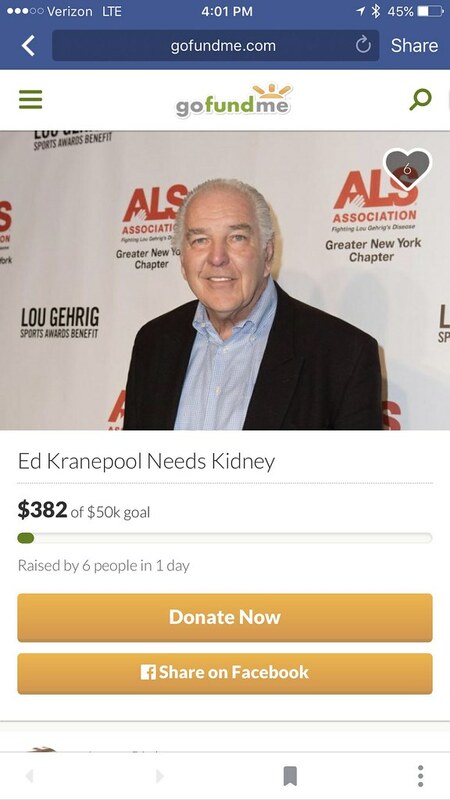 He is one of the beloved players on the 1969 Miracle Mets team that shocked the Baltimore Orioles in the World Series, including his Game 3 heroics when he socked a home run in the 5-0 Amazin's win.But former Mets first baseman Ed Kranepool, who spent his entire career in Flushing, is in need of another miracle now as he prepares for the fight of his life: the 72-year-old Kranepool just had his left big toe amputated Wednesday after an infection surfaced last summer, and he is on a Stony Brook University Hospital waiting list for a kidney donor, what Kranepool calls "the second stage" after this week's procedure. In preparation for a possible kidney transplant and the anticipated sizeable medical bill down the road, the New York City-born Kranepool is having his prized '69 World Series ring and other memorabilia auctioned off this spring. "We're going to see from here where we're going to go. I need a kidney," Kranepool told the Daily News Thursday from his hospital room at North Shore University Hospital, where he had the toe removed. "The perfect way to make it work and get the longevity out of it is to get the perfect match. It's a procedure that two people have to agree on doing. I've already gone in for my testing. But you have to be ready to move (if a donor is found) and that could be overnight." Kranepool, one of the original members of the Mets' inaugural 1962 team that lost a whopping 120 games under manager Casey Stengel, said he's been a diabetic for 38 years and that the infection he got last August could have been related to his diabetic condition. A month later in September 2016, Kranepool said he was having breathing problems and immediately went to the hospital. "I was on a boat trip. I was rushed to the hospital and I thought I was having heart attack. The doctor said, 'I have good news and bad news. The good news is it's not your heart. The bad news is you need a new kidney.' It was kidney failure," said Kranepool. "It's like getting hit in the head with a sledgehammer. You've felt pretty healthy your whole life. That was scary. That's when it bangs you in the head - now you've got a problem. It's not something where you can take medicine. You have to take that (next) step." that he wouldn't damage his kidneys further. His health was exacerbated when the infection later spread to the bone in his foot. "It created an infection to the bone - osteomyelitis," said Kranepool. "Kranepool said he was walking around Thursday after the procedure and that overall he felt "good. ""I won't do any feet commercials," Kranepool joked. "You gotta look at the bright side. They got the infection. The swelling (in his foot) has gone down. This whole thing is for the second stage, the kidney."